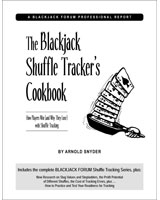 Arnold Snyder is a high-stakes professional gambler who has been writing about casino games for over two decades. He has authored hundreds of articles on gambling in dozens of publications in the past twenty years, including Blackbelt in Blackjack and the Big Book of Blackjack. In January 2003, Snyder who is one of the great legends of blackjack, was elected one of the seven charter members of the Blackjack Hall of Fame.